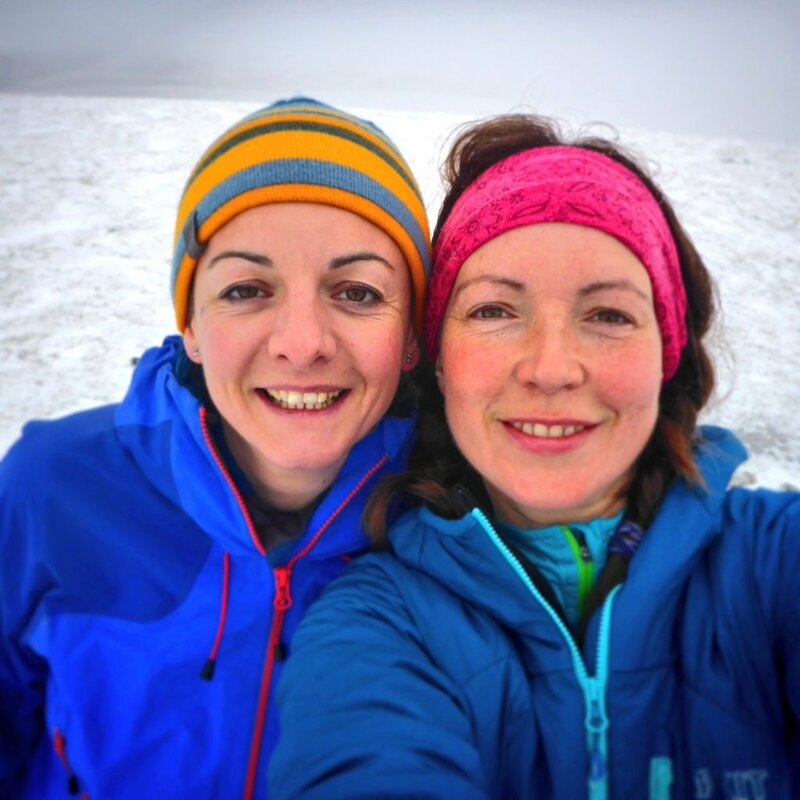 Lucy writes: Jen and I headed up in to the Monadhliath yesterday for a day of navigation and running around in the snow. It was meant to be an easy day, but Geal Charn is a fair slog up, and with the bad vis and full on micro nav it felt like a proper Scottish day out. I was delighted that there was enough good snow for me to spend most of the day in snowshoes. Poor Jen had to wade bare booted for much for the day. Nails! The last couple of days have seen a gradual thaw accompanied by damp conditions. We didn't let that stop us today and headed up on to the hills above Kinlochleven with friend Jen. Once on the ride, the wind was pretty ferocious and conditions under foot slippery with wet snow and melting ice. We topped out on Na Gruagaichean and retraced our steps towards Kinlochleven. As we descended below the cloudbase, we were treated to the most fabulous views of Loch Leven and the Pap of Glencoe. With fresh snow overnight and more falling, we headed out East today for a bit of a winter warm up, in search of the famous "White Room" and some navigation. Although snow fell all day, we didn't really find whiteout conditions, but we did do plenty of nav: up A' Cailleach and over towards Carn Slugain, two rounded Munros in the Monadhliadh. We had a great day, visited a bothy we hadn't been to before. We enjoyed a few sightings of bounding mountain hares along the way. 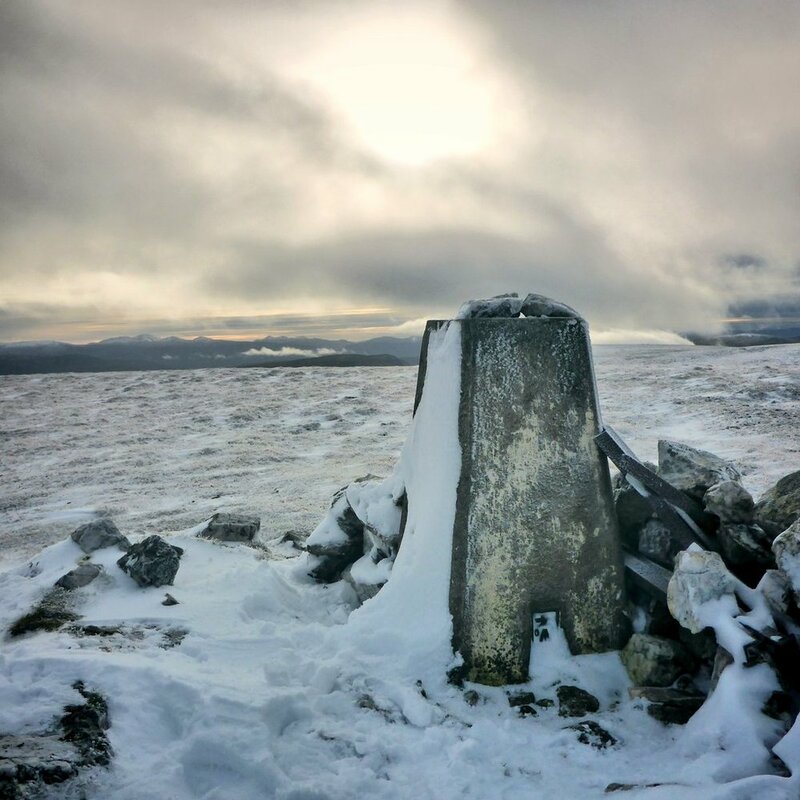 Lucy writes: We are enjoying settling in to our base up near Fort William and although winter is a little sparse at the moment, we've been seeking it out up high. Today Wally and I set off with friend Jen for Creag Meagaidh. With cold firm snow patches, its in very friendly condition for hill walkers at the moment, with none of the frequent avalanche hazard in The Window. Not much snow in The Window! It was cold and beautiful up on the Plateau. A chilly wind kept everyone moving to the summit. We descended via Puist Coire Ardair and cut steps on several snow patches on the way down. Viewranger track of our route.